The following lines are concerned with the amount of calories in the spicy tuna roll. This is one very popular dish all over the world and it is made from raw fish. 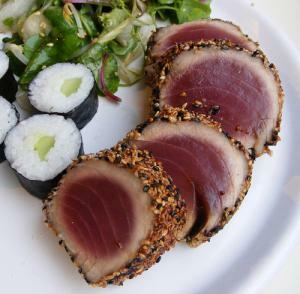 It is involved in a sushi preparation and logically, it is made of tuna. Fish is very good for people who are trying to lose weight and this is due to the fact it has no additives that can hamper the nature of low amount of calories it has. Due to these properties, tuna is a great choice for people who are looking for low calorie foods that promote weight reduction. Also, spicy tuna rolls are great and have great taste unlike sushi, which is really tasteless. Tuna is very healthy, but is it still low on calories when prepared in spicy tuna roll, which has a lot of spices and mayonnaise. Due to the preparation and the ingredients used for the preparation of spicy tuna rolls, the count of calories will be a bit higher than in raw tuna. We all know how caloric mayonnaise is and it is included in the spicy tuna rolls. You can use other ingredients instead of mayonnaise, but such meal you will have to prepare at your home. Mayonnaise will be included in the great deal of spicy tuna rolls that can be bought in the supermarkets, and they will have higher amount of calories due to this spicy mayonnaise. But which number of calories is present in this dish? In just eight pieces of spicy tuna rolls there are 290 calories. When this is compared to other meals and when we have in mind that most people will satisfy appetite with eight spicy tuna rolls, 290 calories per meal are quite reasonable. There are other good news and they are concerned with the amount of fat in these 290 calories. In these calories, there are only 11g of fat and less the 1g of saturated fat, which is also great and which will make a lot of people who are trying to reduce weight happy. In the 290 calories, there are 26g of carbohydrates, which is a bit higher, and in them, there are 3.5g of dietary fibers. So those who are avoiding carbs should not consume spicy tuna rolls. There are a lot of proteins in spicy tuna roll, more precisely, 24g of proteins. Also, there are 560mg of sodium in packed spicy tuna rolls, while fresh have 23mg.